The Bonaventure was the first Federation Designed Warp Powered ship, all other designs had been underway before the foundation of the Federation. An experimental vessel, the Bonaventure was used as a showpiece for Federation technology, and was one of the first vessels sent on long duration exploratory missions. She was designed as a smaller counterpart to the Battle Cruiser Prototype. Tragically she was lost on her third mission, although the USS Enterprise located her in 2269, and it was established she had been pulled into a parallel universe of some type. 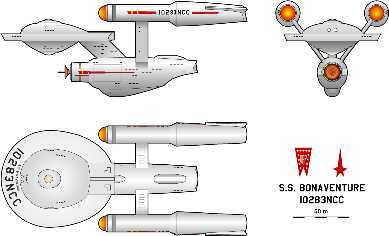 Only the Bonaventure was built, as Starfleet felt that a larger number of smaller vessels could perform the exploration role more effectively. This position did not change until the Klingons became a greater threat in the early 23rd century.